Beanbug was created in 2012 by myself, Rich Taylor, with help and support from my wife Lou Taylor and encouragement from my friends and family (most of whom thought I was mad). I had been inspired 12 years earlier on a bike ride from Bath to Stonehenge with Rinkydink, Cycles Maximus and some of the wackiest bikes in Europe! I could see the potential in Cycles Maximus design of tricycle that could be used for almost anything. It wasn't until 2006 that I saw the first use of one of these trikes as a Cappuccino bar. It was then that I decided that was what I wanted to do, in the greenest way I possibly could! However I was selling the Big Issue, living very hand to mouth and couldn't raise the funds to buy one. After about 5 attempts over 6 years I finally succeeded in buying a second hand Cycles Maximus tricycle as a used London Taxi. In January 2012 I found a refurbished Astoria Espresso Machine supplied by local coffee company Base//Coffee. They installed it and gave us an incredible amount of support and training over the following few months, and year. Building the coffee bar on the back was a bigger challenge than originally thought! It took 6 months, and we were trading by the beginning of May. Our lucky break was being offered a pitch on Totnes Good Food Sunday Market, and also the new Plymouth Good Food Sunday Market. two events that saw the rise of the beanbug to the forefront of conversation in the Coffee world of Devon. This was thrown into the limelight by the Totnes Anti-Costa campaign, which was primarily a campaign to keep chains out of town, however made all independent coffee businesses up their game. 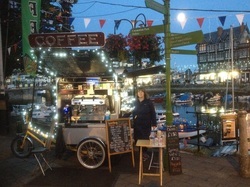 On the 20th May was the first Totnes Independent Coffee Festival. Beanbug was used to host the Barista Competition. The festival was a huge success for the local coffee businesses and was an incredible springboard for beanbug to leap from. It was also a massive boost, and wonderful coming together of the local community. Since then we have been trading at festivals, parties, school fairs, village fetes, food festivals, a cycle path opening event for Devon County Council, University events, christmas markets, late night shopping, and not forgetting our coffee round cycling fresh espresso around Totnes Industrial estate and town centre several times a week. Beanbug has become a successful small coffee business. I can make a very good coffee, and im always getting very good feedback about how astounding our coffee is. Many people say its the best coffee in town, or the best coffee they ever had! We can serve large volumes of drinks quickly, and getting booked for all sorts of events.